Vellum Paper ("Vellum") 17 lb. Vellum is 100% rag (cotton) content which is a higher caliber paper than pulpwood or groundwood content, making for a longer lasting sheet. The heavier 20 lb. weight adds the benefit of durability against frequent handling. 17 lb. vellum paper is available in the following engineering and architectural sizes shown below. Roll sizes available include 24- and 36-inch wide rolls. Graytex vellum is designed for black-and-white or monochrome plotting applications. It is designed to replace the vellum paper for pen plotters from Hewlett Packard which was discontinued after today's inkjet plotters were introduced and became widespread. HP DesignJet Printers: 17 lb. vellum paper ("vellum") is appropriate for monochrome DesignJet applications on printers such as the HP DesignJet 100, 120, 430, and 1050c printers. Available in the engineering and architectural sheet sizes shown below. 50 yard rolls are also available in 24 and 36 inch widths. 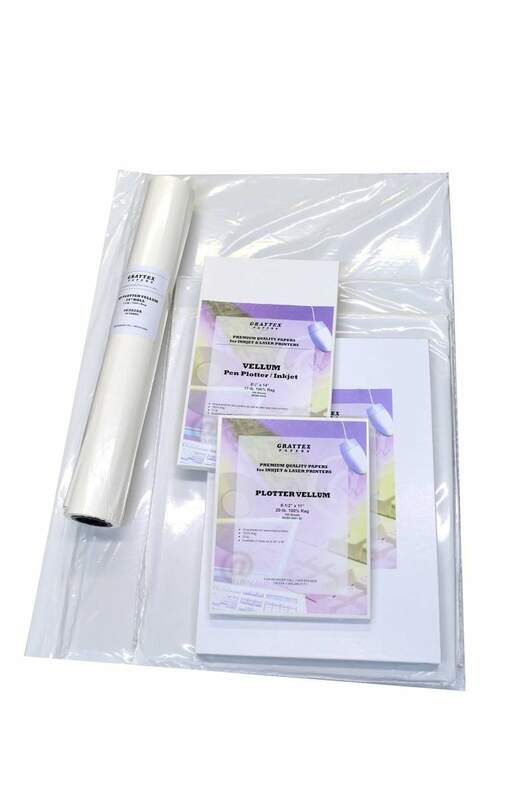 This translucent/vellum paper is compatible with monochrome inkjet plotting applications and all traditional pen plotters. It is designed to replace pen plotter vellum from Hewlett Packard which was discontinued after modern color inkjet plotters were first introduced and became widespread. HP DesignJet Printers: 20 lb. translucent/vellum paper above is a viable monochrome plotter paper on inkjet plotters such as the HP DesignJet 100, 120, 430, and 1050c printers.